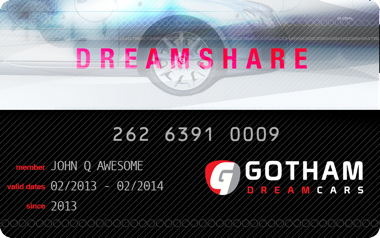 DreamShare is Gotham Dream Cars' timeshare / fractional-style Membership Club Program - designed to provide a convenient way for frequent drivers to access our entire fleet at discounted rates with a minimum of hassles. DreamShare members can purchase rental time at significant discounts for use in any vehicle - in any city - at any time. And the more credit you purchase at a time, the bigger discount we offer. There is no better way to experience the benefits of owning a multimillion-dollar collection of exotic cars (short of going out and buying a multimillion-dollar collection!). Gone are the absurd capital requirements of ownership and the hassles of maintenance, downtime, insurance, storage and transport. As a DreamShare member, you focus simply on enjoying the driving experience and leave everything else to us. First, choose your membership level. DreamShare is available in three packages designed to suit both casual and frequent drivers. Each consecutive membership level offers a greater discount in driving credit. You'll have access to our entire fleet of vehicles right away. And each time you get behind the wheel, the check-out process will be super streamlined. Our staff gets to know our DreamShare members very well -- we'll learn your style, tastes, vehicle preferences, and how to make everything just so. - Designed for recreational drivers who desire the benefits of discounted vehicle access and our white-glove DreamShare service. The cost to join as a Titanium member is $18,000 and the membership offers $20,000 in rental credit. - Receive a greater discount for more driving time. The cost to join as an Elite member is $28,000 and the membership includes $35,000 in rental credit. - Our highest level offering. You receive the most additional credit and maximum discount available to any customer. The cost to join as a Diamond member is $49,000 and the membership includes $70,000 in rental credit. Elite Service - In addition to our standard benefits (if you can call them "standard") including personalized vehicle tutorials, 24/7 roadside assistance, free GPS, etc. all DreamShare members are known on a first-name basis by every member of the Gotham Dream Cars staff. We'll learn your style, anticipate your needs, and make the process of getting and returning vehicles as simple and enjoyable as possible. Speed - Reservations, check-in and check-out are streamlined to be quick and efficient. We know your time is valuable, and we will ensure the fastest possible turnaround. Flexible hours - Need an extra few hours with your vehicle? Need to return at 8pm on Friday night? Not a problem for DreamShare members. Pay only for what you use - Other club programs offer a flat rate regardless of vehicle. This is great -- if you only ever drive the most expensive car (and everyone can't do that all the time). Sooner or later, you'll end up driving a less-expensive car and subsidizing your fellow members. We don't believe that's fair. As a DreamShare member, if you want to drive a Range Rover or S-class one weekend, you'll pay a lower cost. National Access - DreamShare is the first exotic car club program in the country with full unrestricted access for members in 3 cities across both coasts - your points are good wherever you are. Heading to Miami for a weekend? We'll have a Murcielago for you at the airport. Ready for a cruise to the Hamptons? Your F430 is too. Up for a weekend cruise along Mulholland Drive? The McLaren is waiting for you. Access - Never be without a car - if a car suffers a mechanical issue (and though it pains us to say, it does happen to exotics from time to time), we will replace your vehicle with another one from our fleet in the blink of an eye. Compare that to months of potential downtime if you were to own the vehicle outright. Free Delivery - All DreamShare members are entitled to free delivery and pick-up of your vehicles within 60 miles of NYC, Miami, or Los Angeles. Discounted delivery service is also available to areas beyond. We operate our own fleet of trucks and enclosed trailers to ensure timely service and safe transport. Your credit doesn't automatically expire - Once you join as a DreamShare member, your credit can be used until the end of time (so long as you use it at least once a year.) Unlike other club programs where unused credit become invalid after 12 months as a "gotcha", your DreamShare credit stays active as long as you do. Lower member-to-car ratio - While other clubs offer a 5:1, 8:1, or even 10:1 member-to-car ratio, we aim for a 3:1 ratio. That means there's a better chance that you're going to get the car you want to drive on the days you want to drive it. Rent First...Join Later - Not sure if DreamShare is right for you? Don't worry - we offer a no-obligation test drive on all vehicles. Just rent any vehicle from our fleet, and if within 30 days you decide to join the DreamShare program, we'll apply your rental fee towards your membership and retroactively credit your account to give you all of the DreamShare discounts & benefits - as if you joined in the first place.